I am experiencing a deep satisfaction right now. You know that “In the Know” feeling. When you know something really cool, and then the information finally gets out and you kind of sit back sort of nonchalantly and say, “Oh yeah, I knew about that”. Not exactly a virtuous character trait, I know, but I can’t help it, let’s just chalk this up to one of my many personality defects. Hey, nobody is perfect, especially not me. But I have been the pariah on too many occasions over this particular food issue to not feel, at least a little, vindicated. I wrote a little blurb on BakeSpace back in August 07, along with the recipe, (although my method has changed slightly since then) during one such soirée through pariahdom at an "Italian" restaurant. I always feel better after sharing on BakeSpace, my support network of fellow food enthusiasts who actually “get” me. It’s great! Anyway, I just read the May issue of Saveur and lo and behold, Tom Coleman has revealed the truth as well, in black and white. 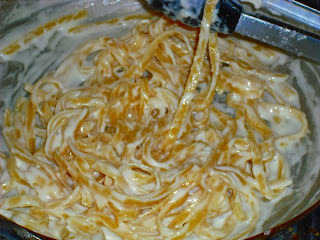 Real Fettuccine all’Alfredo does not contain cream. If it does, it's a very infinitesimal amount and honestly, pasta water works better anyway. It is also not a sauce tossed with pasta, as we know it in the United States, it is a sauce built on pasta by tossing. This is akin to the technique used to produce Linguine alla Carbonara. Coincidentally, both of these dishes hail from Rome. Don’t get me wrong, I am not knocking cream sauces over pasta in any way. I make Chicken Fettuccine with cream, I just don’t call it "Alfredo". But once you have tasted the divinely inspired pasta dish that is Fettuccine all’Alfredo, as I did at Arrivederci Ristorante, nothing touted by Olive Garden or Macaroni Grill as “Alfredo” will do. It becomes a universal truth revealed, as you are bathed in rays of sunlight streaming through a break in the clouds. OK, maybe that is a little too melodramatic, but I swear, it IS divinely inspired. The recipe is extremely simple, like most classic Italian dishes, yet immeasurably flavorful. If you are a lover of Parmigiano-Reggiano, this is the dish for you, for it showcases this amazing cheese in all of its subtle nuanced glory. Since I have placed a link in this post to the original recipe I posted on Bakespace, which serves 4-6 depending on whether it is served as a starter or as a main dish, I am going to break this down into a per-person serving. (Which is actually how I normally do it) Because you will only want to make as much as you need. This is an "Eat it while it's hot" pasta dish and does not re-heat well. Which explains why there are so many Mornay-esque "Alfredo Sauces" out there as they are more forgiving upon reheating. Cut up 1 oz of the butter and place in skillet over REALLY low heat. Add the sliced butter and toss quickly to melt. Add the Parmigiano-Reggiano cheese and toss vigorously by shaking the pan or using the tongs to toss. If it is still dry and grainy, then add warm cream and continue to toss until the sauce smooths out. Serve immediately in a warmed bowl (this is also important, it must stay warm). It’s THAT simple… And it’s THAT delicious. AWW, Thank you Michele... :) That means a lot. That looks fantastic, I had heard that the original didn't have cream but never really investigated it. Learn something every day. Heh. I've seen this done as a sauce only and then poured over gnudi.